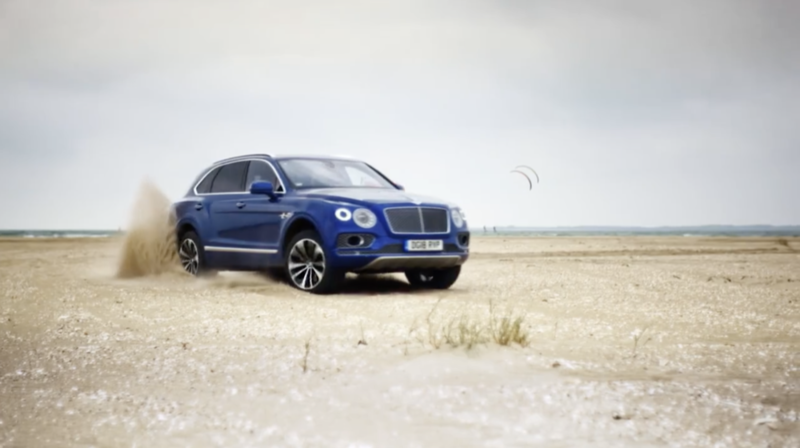 Can a kitesurfer really outrun a Bentley on the beach? We recently brought you news of a race between a McLaren Senna and a couple of motorcross bikes up the Goodwood Hill, now here’s a Bentley Bentayga V8 up against a couple of kitesurfers. In a race to prove (we assume) the Bentayga’s prowess on sand (in its ‘Sand’ off-road mode), the 550hp SUV was driven by Guy Smith, Bentley ambassador and no less than a Le Mans winner. He was up against a couple of carbon hydrofoil boards, ridden (surfed?) by Florian Gruber and Guy Bridge – these being, respectively, the six-time world champion kitesurfer, and current world number two and reigning European champion. On the face of it, the Bentley has the unfair advantage – the name of the race, incidentally – because it can hit 180mph (290km/h), while the kitesurfers attain almost 58 knots, or 66.7mph (107km/h). But having to make a 180-degree turn might play into the kitesurfers’ favour, because they’re far more agile on the sea than the hefty SUV is on the sand. So who will win? Well, you’d better watch the video here and find out, hadn’t you…?